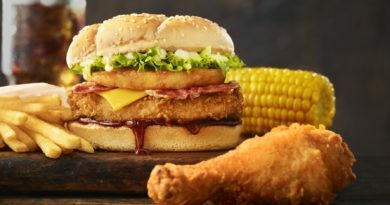 Try our new Zinger Stacker. If you’re looking for a hunger busting spice sensation, here it is. 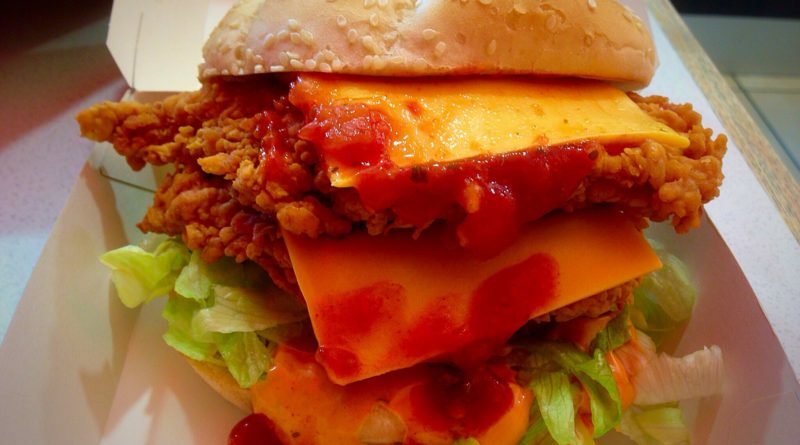 With two juicy Zinger Fillets, two slices of melted cheese, lettuce, spicy supercharged sauce and chilli relish. Oooh yeah! Calories: 714 kcal (2,993kJ in Australia). 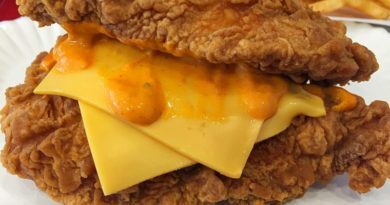 WARNING: This item is not available on the conventional KFC UK menu and is currently available at KFC Australia – the production of this secret menu item is at the discretion of the KFC restaurant. Hats off to KFC UK – we’ve created the Double Down before and asked McDonald’s to make us a Double Big Mac (by handing over a print out of the item from the Canadian website which they declined) but we’ve always had to make them ourselves by ordering the necessary ingredients. 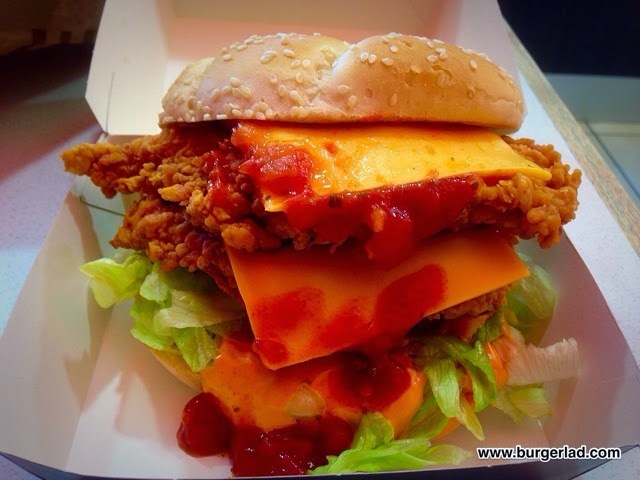 Some time ago, Burger Lad® tweeted about an Australian KFC item – the Zinger Stacker. It is still available in Australia, but not here in the UK. Not officially, anyway. As a very big fan of the Zinger, when I saw this, I immediately thought – Wow, when is the next flight to Canberra? I’ve got to get my mouth around this. 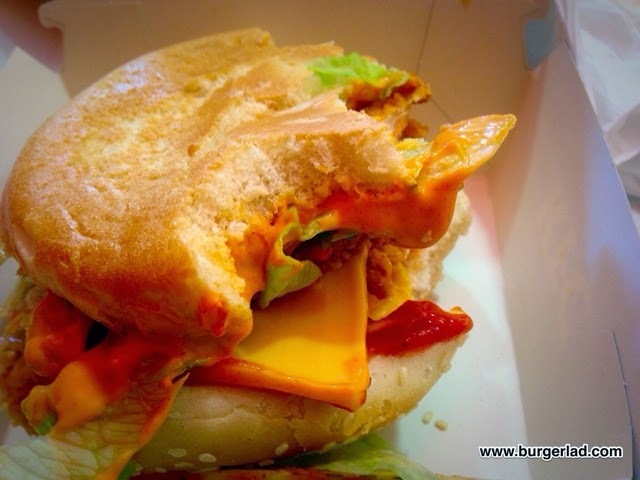 It’s essentially a double Zinger with both chilli relish and supercharger sauce. As such, I thought it might be possible to make here. 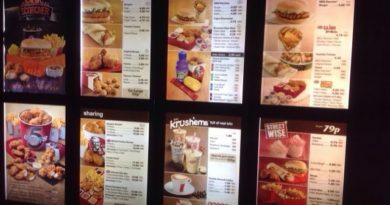 So I challenged my local KFC branch to make it for me, armed with the printout from the Aussie KFC website. To my great pleasure, they were up to the challenge. The only condition was that they would charge me for two Zingers. At £6.78 I felt confident that was less than a flight to Australia, so eagerly agreed. After a short wait, my burger arrived, presented in the classy black box of the Ultimate Burger. It looked big. I could make this review very short: “I knew it was going to be good and it was”. But I’ll elaborate. Australians must have bigger mouths than I, because this was impossible to eat tidily. The height meant that stuff was itching to escape right, left and centre. But it was marvellous. 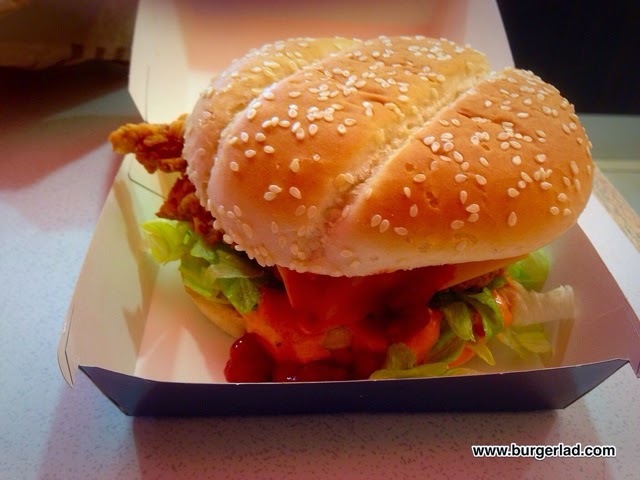 The Zinger coating, the chilli relish and the supercharger sauce made this noticeably hot. That’s a good thing. There simply aren’t enough spicy offerings amongst high street burgers here. I actually don’t know what the supercharger sauce is, but it is orange. Together with the relish, it worked well to build up a considerable zing. Two chicken fillets in this accounted for the size. The chicken was as good as ever, a bit sticky on the teeth and good solid generous chunks. That’s no lid… that’s a stack…! The lettuce, as you might expect, got rather lost in all this. Not surprising, but at least it wasn’t bloody tomato. Despite the size, I finished this off quickly and was left with the familiar Zinger heat in my mouth and a smile on my face. Very, very tasty! 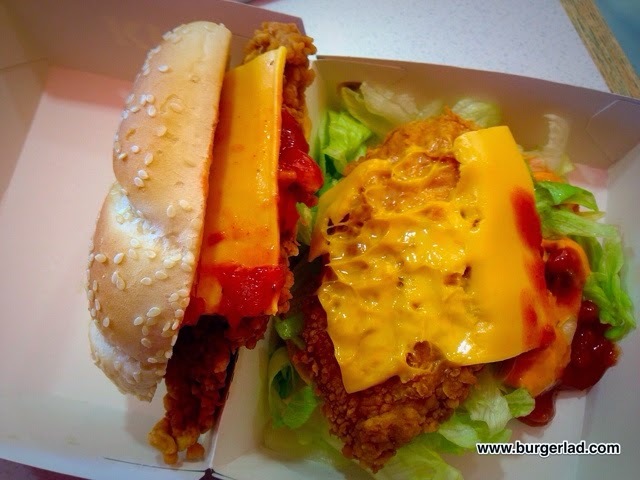 The Aussie KFC Zinger Stacker CAN be done here. Give it a go! Good work Admiral – again excellent customer service from the guys at KFC, will you be trying the Zinger Stacker anytime soon…!? As an Aussie expat I can certainly give you some insight here. We Aussies don’t have bigger mouths, well, not for eating with anyway, but, KFC is totally different. The Aussie burgers seem to have larger buns, and a lot more Mayo/sauce. They don’t fall apart quite so easily as they do here. The chips are also a bit fatter and come ready seasoned. That’s the real magic of KFC actually, the seasoned salt on the chips. The only side dish is potato and gravy, most of us use this to dip our chips in and it just adds to the whole experience.